Two very different bodies of work by Jim Hittinger and Shannon Estlund find an eerie common ground this month at Rosalux Gallery. Grouped together under a single roof, the two solo exhibitions on view at Northeast’s Rosalux Gallery offer linked but divergent approaches to painting. Both concerned with landscape and similarly imbued with a certain dark energy, the paintings by Jim Hittinger and Shannon Estlund fit comfortably in the same space while maintaining each their own independent focus. Separated by a shared wall, the two exhibitions depart from the same place but end up in very different territories. Hittinger’s paintings and works on paper occupy the first space. Of these pieces, the works rendered on canvas are clearly the strongest. The tooth of the canvas surface provides Hittinger with the suggestion of earth or a muddied patch of snow perhaps, even in the large swaths of his canvases that are left blank. Hittinger seems intent on stripping away — details, context, and content — giving us only the slightest suggestion of the scene. The results are powerful, moody, and somehow sinister. Hittinger’s canvases are minimally populated, often featuring one solitary figure in the frame. His focus is often a bit blurry, this myopia evoking a similar feeling as paintings by Luc Tuymans and Gerhard Richter, who also use a sort of soft focus to convey the haziness of memory and the imprecision of our perceptions. Hittinger lives in this territory as well; though it’s not spelled out, his paintings also come across as sketches, impressions, or fragments of memories. 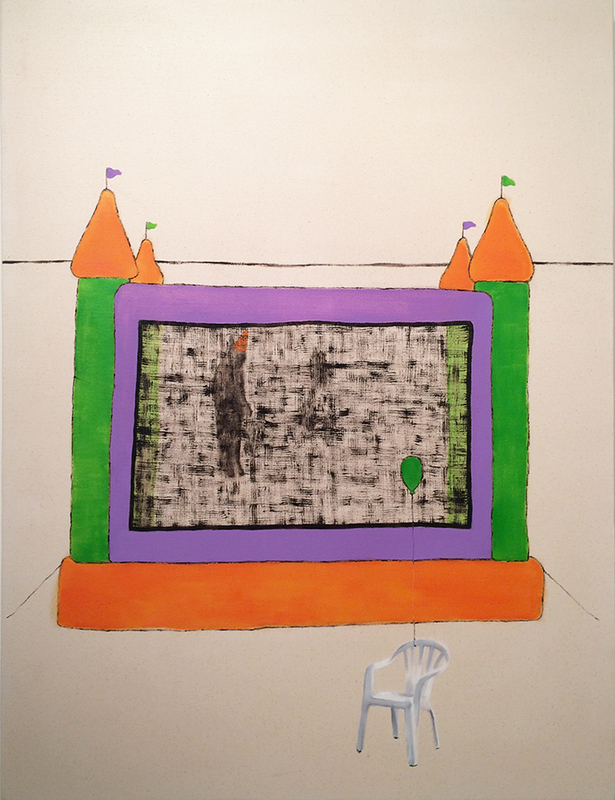 In some of his paintings, Hittinger slaps festive elements — a purple, orange, and green bouncy castle in one work, a smiling snowman in another — against stark backgrounds, rendering these usually joyous objects grim. The bouncy house, for instance, is occupied by one shadowy figure who wears an orange party hat, a solitary reveler at this Birthday Party. Though the scene and the title imply a celebration, the figure here carries no expression or suggestion of movement. Save a jarringly detailed plastic chair that floats in the background, the landscape around the inflatable castle has been entirely evacuated — of people, of detail, of color, of any surrounding context. 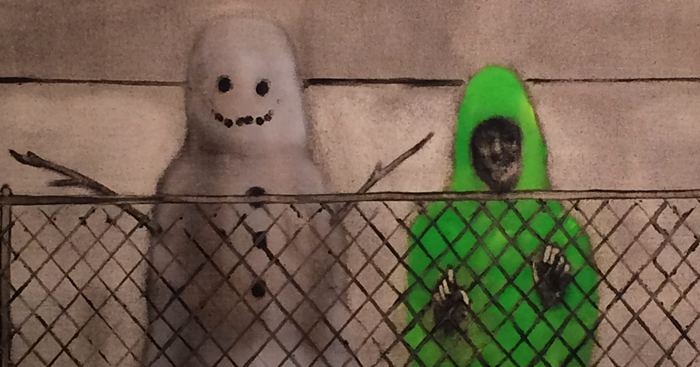 In Decoy, a figure (presumed to be male) stands behind a chain link fence, next to though slightly closer to us than the aforementioned snowman. 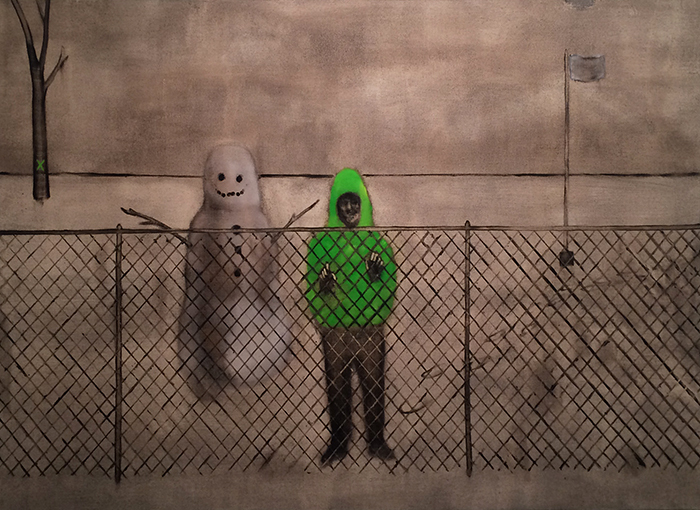 Shrouded in a hooded sweatshirt and gripping the wire of the fence, this character faces out towards the viewers, but his posture and mostly obstructed expression leave his attitude ambiguous. The uniform dullness of the background — a mottled brown and gray shades the entirety of the snow and sky in this scene — tells a rather clearer story, however. While Hittinger’s paintings have aimed to let the details fall away, leaving small groups of elements visible to sketch in our impressions, Estlund’s paintings are brimming with intricacies. Her painted landscapes are lush, her wooded scenes fecund with growth but starkly depopulated. 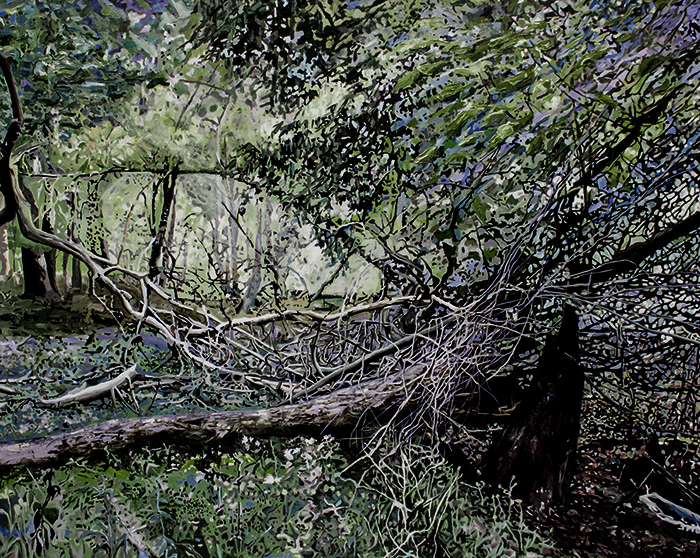 Estlund approaches the wildness of nature from several different points of view, taking both zoomed-in and panoramic views of natural scenes. Her paintings that take this broader perspective are perhaps the most successful here: almost photographic from far away, they dissolve into abstraction when viewed at close range. At a distance, the sharp highlights on branches and thick sprays of leaves look precisely rendered, but up close, these elements melt into geometric patterns of color, light, and dark. By dividing up her images into these smaller fragments — something like a paint-by-numbers project — Estlund balances abstraction and clarity. 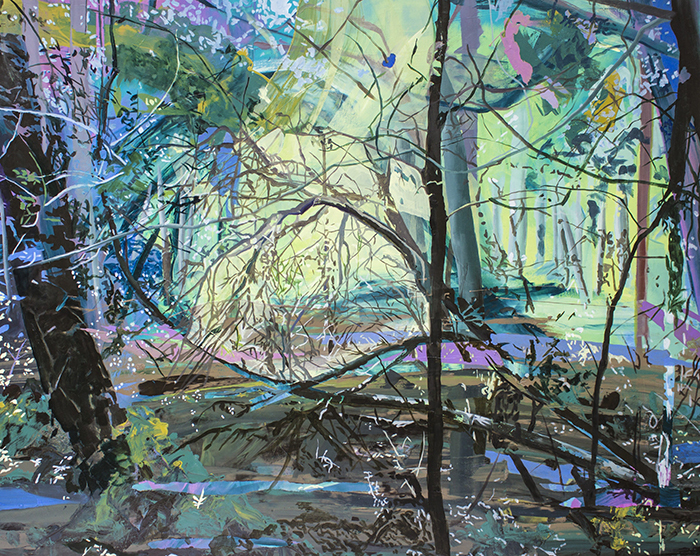 In Expansion, a fallen log and tangled branches stretch across the lower half of the painting, with a glimpse of brightness gathered in the center of the work—not the sky, but a pool of light. The edges of the work are bursting with foliage, twigs, and wildflowers. In Romance, a moody purple sky is framed by dark outlines of trees and bisected by a drooping scatter of delicate leaves. A luminosity in the center of both works is juxtaposed by the density of each surrounding. This contrast between lightness and obscurity creates tension, contrast, and just a bit of suspense in these works. In some of her smaller pieces, this tension is missing, and the glimpses, fragments, and patterns of landscape are left lying flat on the canvas. Estlund’s more captivating works evoke a tension that resonates back to Hittinger’s works, a shared darkness imagined in the unknown and unseen. The artists’ common interests seem to lie in the fraught edges of memory, sight, and light. Graveyard Shift & Low Visual Distance will be on view through August 27th at Rosalux Gallery. Open Saturdays and Sundays, 12 - 4pm.